Contrary to media reports that the medals of former Super Eagles skipper, Kanu Nwankwo had been carried away from the Hardley Apartments, Assets Management Corporation of Nigeria (AMCON) has said the takeover of the property had been done with the consent of the court of law and no medals were taken in the process. A statement issued by AMCON and signed by its spokesperson, Jude Nwazor, said that the story had been twisted to garner public sentiment. 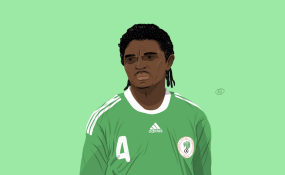 "The attention of Asset Management Corporation of Nigeria (AMCON) has been drawn to some inaccurate stories that are sponsored and published in the media meant to mislead the public and whip up sentiments for former Super Eagles player, Mr. Nwankwo Kanu. "We also want to put on record that having exhausted all avenues of peaceful resolution as a result of the huge debt; extended so many invitations for discussion, which were turned down, AMCON in 2015 obtained an order from the Federal High Court, which granted the Corporation possession of The Hardley apartments located at No. 46 Waziri Ibrahim Crescent, Off Elsie Femi - Pearse Crescent, Off Adeola Odeku Street, Victoria Island in Lagos State, being the asset pledged as collateral for the loan. "The procedure was done with the Court bailiff and inventory of property was taken, which did not include any medals as claimed. This order still subsists, pending the determination of the substantive matter. The public should therefore please disregard these misrepresentations as we await the pronouncement of the court on the matter." He also noted that the corporation "is not in the habit of joining issues with obligors on the pages of the newspapers especially when the matter is in court as in this one. It is noteworthy that similar clarification was made by the Corporation in 2017, when the debtor claimed that AMCON had illegally taken over his hotel. However, as a law abiding recovery agency of the Federal Government of Nigeria, we are at all times guided by the law and would continue to act accordingly irrespective of obligor's social, political or economic status.